Innate CD8 T cells are found in mutant mouse models, but whether they are produced in a normal thymus remains controversial. Using the RAG2p-GFP mouse model, we found that ∼10% of TCRαβ+ CD4−CD8+ thymocytes were innate polyclonal T cells (GFP+CD44hi). Relative to conventional T cells, innate CD8 thymocytes displayed increased cell surface amounts of B7-H1, CD2, CD5, CD38, IL-2Rβ, and IL-4Rα and downmodulation of TCRβ. Moreover, they overexpressed several transcripts, including T-bet, Id3, Klf2, and, most of all, Eomes. Innate CD8 thymocytes were positively selected, mainly by nonhematopoietic MHCIa+ cells. They rapidly produced high levels of IFN-γ upon stimulation and readily proliferated in response to IL-2 and IL-4. Furthermore, low numbers of innate CD8 thymocytes were sufficient to help conventional CD8 T cells expand and secrete cytokine following Ag recognition. This helper effect depended on CD44-mediated interactions between innate and conventional CD8 T cells. We concluded that innate TCRαβ+ CD8 T cells represent a sizeable proportion of normal thymocytes whose development and function differ in many ways from those of conventional CD8 T cells. Innate immune cells are necessary and sufficient to cure most infections (1). Nevertheless, as a complement to innate cells, the adaptive immune system confers greater specificity and flexibility in responses to pathogens (2, 3). 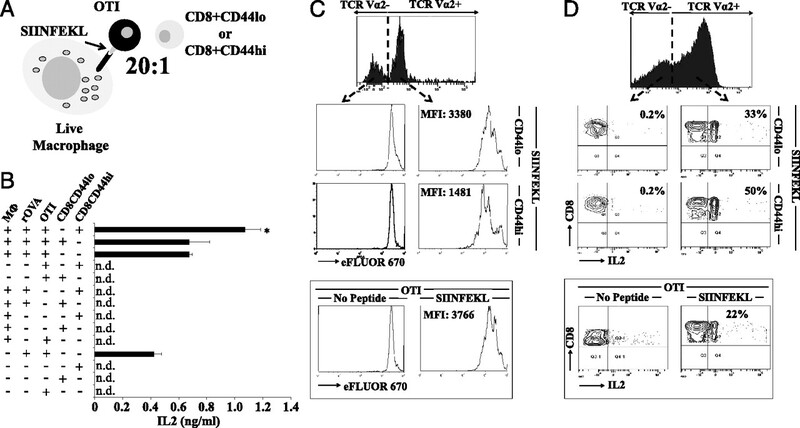 CD4+CD8− and CD4−CD8+ TCRαβ T cells epitomize classic adaptive T cells. Compared with innate cells, classic TCRαβ T cells display greater TCR repertoire diversity, as well as a naive phenotype when exiting the thymus, and do not exhibit immediate effector function (4). However, not all T cells are conventional adaptive T cells. Some T cell subsets are categorized as innate T cells because they display an effector-memory phenotype and a limited TCR repertoire diversity and rapidly produce cytokine upon TCR engagement. The best-characterized innate T cells are γδ T cells, which mediate lymphoid stress-surveillance response to tissue perturbation (5), and CD1d-restricted CD4+/−CD8− NKT cells, which react to lipids and other hydrophobic Ags (6). It is well known that conventional TCRαβ T cells can acquire an effector-memory phenotype and effector function in the periphery following interaction with their cognate Ag or following homeostatic expansion (7, 8). However, studies reported over the last few years revealed that, unlike innate T cells, some CD8+ TCRαβ T cells display an effector-memory phenotype and effector function “from birth” (4, 8). Such innate CD8+ T cells are present in large numbers in two settings. First, the abundant extrathymic CD8+ T cells produced in the lymph nodes of oncostatin M-transgenic mice are innate T cells (9, 10). Second, innate T cells represent a large proportion of CD4−CD8+ TCRαβ T cells found in the thymus of mice deficient for ITK/RLK kinases or transcription factors (ID3, KLF2) (4, 11–13) or expressing an Lck-PLZF transgene (14). In these mutant mice, accumulation of polyclonal innate TCRαβ CD8 T cells is caused by expansion of PLZF+ NKT cells that secrete large amounts of IL-4 (8). But are polyclonal αβTCR CD8 T cells produced in a normal thymus? In BALB/c mice, a significant proportion of CD8 single-positive (SP) thymocytes are CD44hiCD122hi, and their accumulation is dependent on IL-4 produced by PLZF+ thymocytes (11). This finding provides strong, but not conclusive, evidence that innate polyclonal CD8 T cells are produced in a normal thymus. Indeed, it is formally possible that CD44hiCD122hi CD8 SP thymocytes represent effector-memory T cells that have re-entered the thymus (15). Furthermore, the existence of a distinct population of innate CD8 SP thymocytes in C57BL/6 mice was considered, at best, equivocal (8). We used the RAG2p-GFP mouse model (on a C57BL/6 background) to establish whether innate polyclonal CD8 T cells are produced in a normal thymus. We report that ∼10% of CD8 SP thymocytes are innate T cells. Innate CD8 T cells are selected on nonhematopoietic MHCI+ cells in the thymus and present a diverse TCR repertoire, but they differ in many ways from conventional CD8 T cells. Innate CD8 T cells respond rapidly to their cognate Ag and enhance, in a CD44-dependent manner, Ag-specific reactivity of bystander conventional CD8 T cells. RAG2p-GFP transgenic mice were kindly provided by Dr. M. Nussenzweig (Rockefeller University, New York, NY) and backcrossed for ≥10 generations onto the C57BL/6 background (16). OTI (B6.129S7-Rag1tm1Mom Tg[TcraTcrb]10100Mjb N9+N1) and KbDb−/− (B6.129P2-H2-Kbtm1 H2-Dbtm1 N12) mice were purchased from Taconic Farms (Hudson, NY). The following mice were purchased from the Jackson Laboratory (Bar Harbor, ME): TCRβ−/− (B6.129P2-Tcrbtm1Mom/J), B2m−/− (B6.129P2-B2mtm1Unc/J), I-Ab−/− (B6.129S2-H2dlAb1-Ea/J), IL4−/− (B6.129P2-Il4tm1Cgn/J), and C57BL/6. RAG2p-GFP IL4−/− mice were obtained by crossing RAG2p-GFP and IL4−/− mice and backcrossing RAG2p-GFP IL4+/− F1 mice with IL4−/− parental strain mice. RAG2p-GFP mice were intercrossed with OTI mice to generate RAG2p-GFP OTI mice. 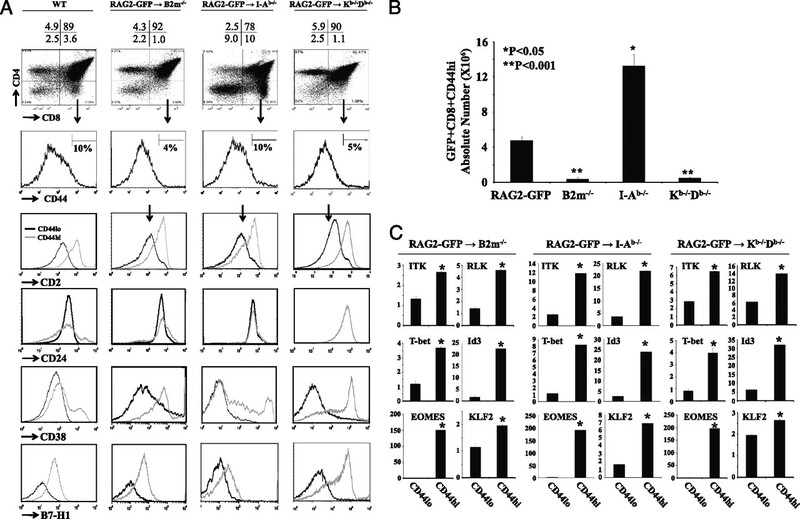 OTI mice are Rag1−/−, whereas RAG2p-GFP OTI mice are Rag1+/−. Peripheral blood from RAG2p-GFP OTI mice was screened for GFP+Vα2+ T cells to identify mice harboring the OTI transgenic TCR and the bacterial artificial chromosome encoding RAG2p-GFP. Mice were housed under specific pathogen-free conditions, and all experimental protocols were approved by the Comité de Déontologie de l’Expérimentation sur des Animaux from the Université de Montréal. Bone marrow (BM) transplantation was performed as previously described (17). rIL-2 and rIL-4 were purchased from PeproTech (Rocky Hill, NJ). All Abs used in flow cytometry, cytokine bead arrays (CBAs), and the BD Cytofix/Cytoperm Kit for intracellular cytokine staining were purchased from BD Pharmingen (San Diego, CA) and used according to the manufacturer’s instructions. Cytokine ELISAs for IL-2 and IFN-γ, as well as anti–B7-H1 Ab were purchased from R&D Systems (Minneapolis, MN) and used according to the manufacturer’s instructions. The SIINFEKL peptide was synthesized by GenScript (Piscataway, NJ); hyaluronic acid, PMA and ionomycin were purchased from Sigma-Aldrich (Oakville, ON, Canada). The SIINFEKL-H2Kb tetramer kit was purchased from IBA (Göttingen, Germany) and used according to the manufacturer’s instructions. CD3-CD28 beads and TRIzol were purchased from Invitrogen (Burlington, ON, Canada); eFluor 670 was purchased from eBiosciences (San Diego, CA). For phenotypic characterization, thymocytes were harvested from RAG2p-GFP mice in complete medium (RPMI 1640, 10% FBS, 5 mM l-glutamine, 10 mM sodium pyruvate, and 25 mM 2-ME). Analysis of cell surface markers and intracellular cytokines was performed by flow cytometry, as described (18). For in vitro-proliferation assays, sorted thymocytes were labeled with 5 μg/ml eFluor 670 for 10 min at 37°C, washed once with complete medium, and washed three times with PBS. To assess the proliferation induced following addition of rIL-2 (0.1 pmol/well) or rIL-4, cells were first treated for 48–72 h, and eFluor 670-staining intensity was analyzed by flow cytometry. Thymocytes were sorted directly in 900 μl TRIzol (106 cells/tube) and stored at −80°C until used for RNA extraction. Briefly, cells were lysed, and the RNA was extracted in TRIzol reagent. Further, RNA purification was carried out using RNA-extraction kits (Qiagen), following the manufacturer’s instructions. Reverse transcription was carried out using the High Capacity cDNA reverse transcription kit, and quantitative RT-PCR (qPCR) was performed with a 7900HT Fast Real-Time PCR system at The Institute for Research in Immunology and Cancer’s genomic core facility (19). Target gene values were normalized to endogenous control GAPDH. Sorted cells were centrifuged and resuspended in lysis buffer at 107 cells/ml. The cell lysate was then transferred to a 500-μl PCR tube, and nested PCR reactions were performed, as previously described (20). The outer primers were 5′-CTGCTGTGTGCCCTACCC-3′ for the forward primer and 5′-GCGACACGAAGAGCTGAACT-3′ for the reverse primer. The nested primers were 5′-GAACACGGAGTATCTCTTTGGAGTG-3′ for the forward primer and 5′-AAGGCATAAAGCGACACGAAGAGC-3′ for the reverse primer. The relative amount of signal-joint TCR excision circles (sjTRECs) in CD44int and CD44hi CD8 SP thymocytes was normalized to that of CD44lo SP thymocytes (21). Briefly, GFP+CD8+CD44lo or GFP+CD8+CD44hi T cells were sorted from RAG2p-GFP thymus, and 5 × 105 cells were injected i.v. in TCRβ−/− mice. Four weeks later, thymi and spleens from TCRβ−/− hosts were harvested and analyzed by flow cytometry (10). Ag-stimulation assays were performed using peritoneal macrophages collected from retired breeder C57BL/6 mice. Briefly, the peritoneal cavity of mice was washed with RPMI 1640, and collected cells were cultured for 24 h. The following day, the macrophages were washed and treated with 1 μg/ml SIINFEKL for 24 h in serum-free conditions at 37°C and then washed before addition of transgenic OTI T cells and sorted GFP+CD8+CD44lo or GFP+CD8+CD44hi bystander T cells (OTI cell/bystander T cell ratio = 20:1). Supernatants were collected and centrifuged 72 h later for analysis of IFN-γ concentration by ELISA. The same assay was also performed using paraformaldehyde-fixed macrophages. To study the role of CD44, GFP+CD8+CD44lo and GFP+CD8+CD44hi T cells were treated with CD44-neutralizing Ab or hyaluronan for 1 h at 37°C prior to their addition to the cell culture. The p values were calculated by the paired Student t test or ANOVA, according to the experimental set-up. Innate CD8 T cells are CD44hi (4, 8). However, in the thymus, a CD44hi phenotype is insufficient to discriminate between innate T cells produced in situ and recirculating effector-memory peripheral T cells that reside in the thymus (22). Therefore, to identify genuine innate CD8 thymocytes, we studied RAG2p-GFP transgenic mice carrying a bacterial artificial chromosome modified by homologous recombination to encode GFP as a reporter protein under the control of the RAG2 promoter (15, 16). This system allowed us to discern between naive conventional CD8 thymocytes (GFP+CD44lo/int), recirculation memory-phenotype CD8 T cells (GFP−CD44hi), and newly generated innate CD8 thymocytes (GFP+CD44hi). Although the expression profile of CD44 is bimodal on peripheral CD8 T cells, it is Gaussian on thymocytes (Supplemental Fig. 1). We defined as CD44hi the SP CD8 thymocytes whose cell surface CD44 expression was similar to that of (effector-memory phenotype) CD44hi spleen CD8 T cells. Based on this criterion, the proportion of CD44hi cells among SP CD8 T cells was 10% in the thymus and 23% in the spleen (Supplemental Fig. 1). Among CD8 SP thymocytes, 10% were CD44lo, and 80% were CD44int (Fig. 1A). Unless stated otherwise, all further flow cytometry analyses were performed on GFP+ CD8 SP thymocytes. Innate CD8 SP thymocytes represent a sizeable cell subset with a distinct phenotype. A, Gate settings used for sorting and characterization of CD44lo, CD44int, and CD44hi (top 10%) CD8 SP thymocytes. B, GFP expression was estimated by flow cytometry analysis, and the relative amounts of sjTRECs were estimated by qPCR. Similar results were obtained in three independent experiments. 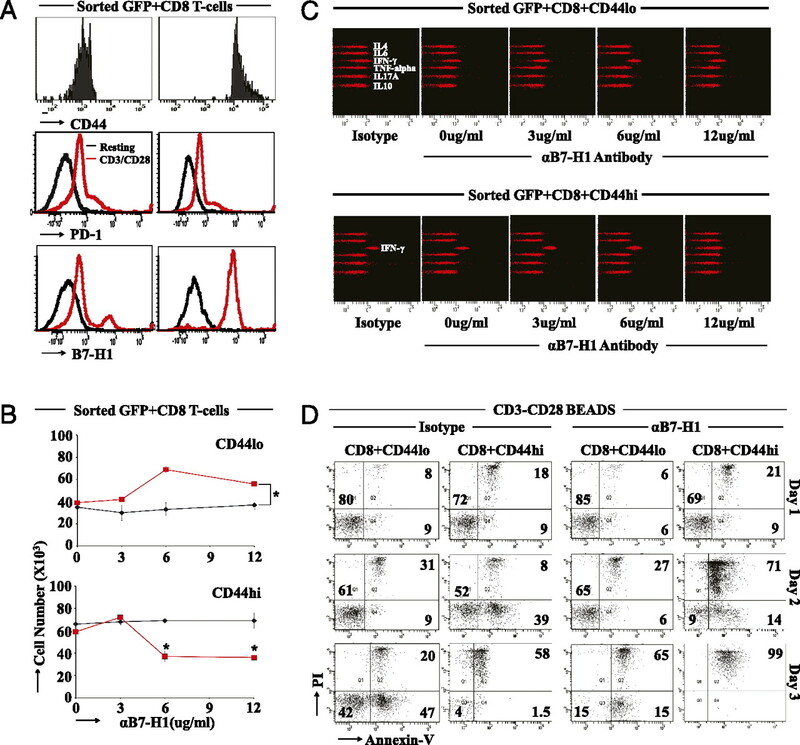 C, Representative flow cytometry analysis of CD5 and CD8 expression on CD8 T cell subsets. D, Flow cytometry analysis of various cell surface markers. E, Expression of TCRβ on total SP CD8 thymocytes (top panels) and SP CD8 thymocyte subsets (bottom panels). F, Flow-cytometry analysis of TCRβ-chains showing that innate CD8 T cells display a polyclonal TCR repertoire. G, Representative qPCR analysis of selected genes involved in CD8 T cell development. We tested four mice/experiment. *p < 0.05. All data shown are representative of three separate experiments. In RAG2p-GFP mice, the mitotic history of thymocytes can be assessed by analyzing the amount of GFP and sjTRECs in discrete cell subsets. Following rearrangement of TCRα-chains (in CD4+CD8+ thymocytes), the amount of GFP per cell progressively decreases (15), and each cell division decreases the frequency of sjTREC+ cells by 50% (23). We found that the three populations of GFP+CD8+ thymocytes (CD44lo, CD44int and CD44hi) contained similar amounts of GFP and sjTRECs (Fig. 1B). This means that, irrespective of their CD44 expression, these three populations were at the same developmental stage and had undergone similar numbers of cell divisions following rearrangement of TCRα-chains. CD5 is an inhibitor of TCR signaling, and its abundance is proportional to the strength of TCR signaling during positive selection (24, 25). We found that CD44hi CD8 thymocytes expressed higher amounts of CD5 than did other subsets of GFP+ CD8 thymocytes (Fig. 1D). Upon further investigation, we found that CD44lo and CD44int GFP+ CD8 SP thymocytes were phenotypically indistinguishable from each other, because they expressed similar levels of CD2, CD8, CD24, CD38, CD45RB, CD62L, CD127, CD132, and B7-H1 (Fig. 1D, 1E). In contrast, innate CD8 thymocytes expressed higher levels of CD2, CD38, CD45RB, CD62L, and B7-H1 than did conventional CD8 thymocytes (Fig. 1E). Of note, innate CD8 thymocytes were not oligoclonal, because they expressed a variety of TCRβ-chains (Fig. 1F). However, they displayed lower amounts of TCRβ than did conventional CD8 thymocytes (Fig. 1). In mutant mice, innate CD8 T cells are characterized by upregulation of Eomes, and their development is regulated by ITK/RLK kinases and transcription factors ID3 and KLF2 (4, 8). At the mRNA level, we found a dramatic (≈130-fold) increase in the expression of Eomes and smaller increases (4–14-fold) for T-bet, Id3, Itk, Rlk, and Klf2 (Fig. 1G). Together, these results showed that innate and conventional CD8 thymocytes present major differences in their developmental program. Thymic epithelial cells (TECs) play a dominant, although perhaps not exclusive, role in positive selection of conventional CD8 T cells (26, 27). However, MHCI+ hematopoietic cells are sufficient for selection of innate CD8 T cells generated extrathymically (28) or in the thymus of Itk−/− and Itk−/−Rlk−/− mice (4). To evaluate the relative importance of hematopoietic and nonhematopoietic cells in selection of polyclonal innate T cells, we transplanted RAG2p-GFP bone marrow cells in three types of irradiated recipients: β2m−/−, I-Ab−/−, and KbDb−/−. In I-Ab−/− recipients, the proportion of SP CD8 thymocytes was increased, as expected (29), but the percentage of CD44hi elements among SP CD8 thymocytes was normal. 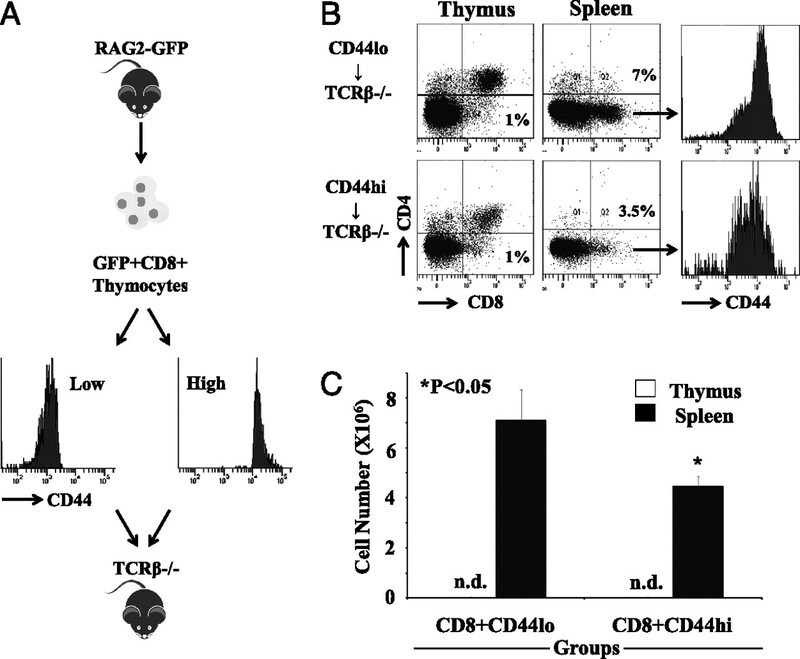 However, the number of GFP+CD8+CD44hi thymocytes was severely decreased in β2m−/− and KbDb−/− hosts (Fig. 2A, 2B). Further phenotypic and gene-expression analyses were performed on the very rare GFP+CD8+ thymocytes present in β2m−/− and KbDb−/− hosts. They showed that CD44lo and CD44hi subsets presented differences in expression of cell surface molecules (CD2, CD24, CD38, or B7-H1) (Fig. 2A) and gene transcripts (Itk, Rlk, T-bet, Eomes, Id3, and Klf2) (Fig. 2C) that were commensurate with those found in RAG2p-GFP mice (Fig. 1G). We concluded that efficient positive selection of innate CD8 thymocytes is subordinate to MHCI expressed on thymic nonhematopoietic cells. Because KbDb−/− hosts, which express MHCIb but not MHCIa molecules, presented the same deficit as did β2m−/− hosts, we inferred that innate CD8 thymocytes are positively selected, mainly by MHCIa on nonhematopoietic cells. However, the few innate CD8 thymocytes that differentiated in the absence of nonhematopoietic MHCI (presumably following positive selection on hematopoietic MHCI) appeared identical to those found in mice with a wild-type MHC. Nonhematopoietic MHC I+ cells are required for the selection of innate CD8 thymocytes. A, Representative flow cytometry analyses of gated GFP+ (donor-derived) thymocytes from irradiated mice transplanted with RAG2p-GFP BM cells. RAG2p-GFP mice were used as positive control. B, Absolute numbers of GFP+CD8+CD44hi (five mice/group). C, GFP+CD8+ thymocytes were isolated from BM chimeras to evaluate expression of Itk, Rlk, T-bet, Id3, Eomes, and Klf2 by qPCR analysis (five mice/group). *p < 0.05, **p < 0.001. To evaluate whether the nature of the TCR could dictate innate versus classic CD8 thymocyte development, we crossed RAG2p-GFP mice with RAG-deficient mice bearing the transgenic Vα2+ OTI TCR (30). As expected, the intensity of GFP staining was decreased in (RAG2p-GFP × OTI) F1 hybrids relative to RAG2p-GFP mice (Fig. 3A). 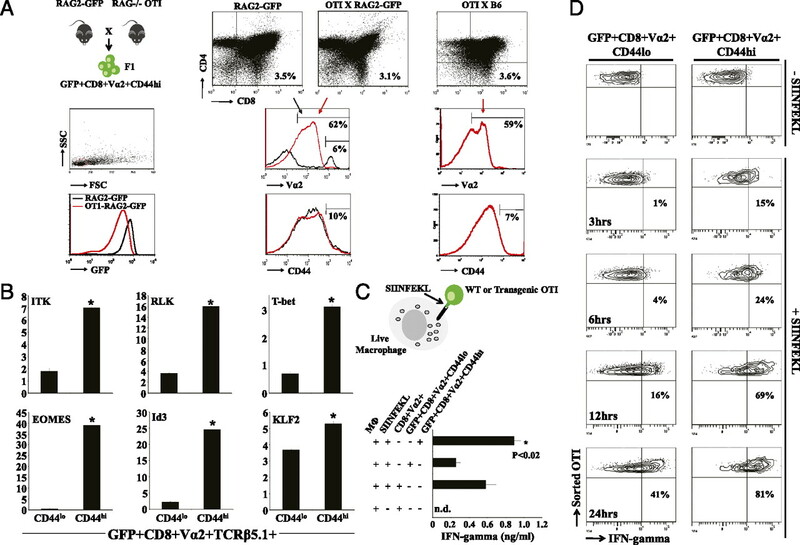 Notably, the majority of CD44lo and CD44hi GFP+Vα2+CD8+ thymocytes from (Rag1+/−) F1 hybrids bound H2Kb-SIINFEKL+ tetramers and, therefore, expressed the OTI TCR, as opposed to endogenously rearranged TCRs (Supplemental Fig. 2). Nevertheless, the proportion of GFP+CD8+Vα2+ thymocytes that were CD44hi was similar in RAG2p-GFP mice and F1 hybrids (Fig. 3A). Similar to what we found in RAG2p-GFP mice (Fig. 2C), GFP+CD8+Vα2+CD44hi thymocytes expressed higher levels of Itk, Rlk, T-bet, Eomes, Id3, and Klf2 (Fig. 3B) than did GFP+CD8+Vα2+CD44lo thymocytes. Therefore, expression of a given TCR (i.e., OTI) is compatible with generation of both classic and innate CD8 thymocytes. Two related points can be made from this observation: the innate versus classic fate is not dictated solely by the nature of the TCR, and classic and innate CD8 thymocytes may have overlapping TCR repertoires. Development and function of innate CD8 T cells expressing a transgenic OTI TCR. A, GFP+CD4−CD8+ cells from RAG2p-GFP mice and (RAG2p-GFP × OTI) F1 hybrids were analyzed for Vα2 expression. GFP+CD8+Vα2+ cells were then analyzed for CD44 expression. (OTI × B6) F1 hybrids were used as a control for the intensity of Vα2 staining in mice hemizygous for RAG2 and OTI genes. B, qPCR analysis of gene transcripts was performed on conventional versus innate CD8 T cells derived from (RAG2p-GFP × OTI) F1 mice (n = 5 mice/group). *p < 0.05. C, IFN-γ secretion was estimated by ELISA following stimulation with SIINFEKL-pulsed macrophages. Data shown are representative of three separate experiments (n = 4 mice/group). CD8+Vα2+, OTI thymocytes isolated from OTI mice; GFP+CD8+Vα2+CD44lo, CD44lo thymocytes from (RAG2p-GFP × OTI) F1 mice; GFP+CD8+Vα2+CD44hi, CD44hi thymocytes from (RAG2p-GFP × OTI) F1 mice. GFP+CD8+Vα2+CD44hi OTI cells secreted more IFN-γ than did GFP+CD8+Vα2+CD44lo cells. *p < 0.02. D, Intracellular IFN-γ staining following stimulation of GFP+CD8+Vα2+CD44lo versus GFP+CD8+Vα2+CD44hi thymocytes from (RAG2p-GFP × OTI) F1 mice with SIINFEKL-pulsed macrophages for 3–24 h. Data shown are representative of three separate experiments. Generation of classic and innate OTI CD8 thymocytes allowed us to compare how they responded to their cognate Ag, SIINFEKL (OVA-derived peptide presented by H2Kb). We assessed IFN-γ secretion by innate (CD44hi) and conventional (CD44lo) GFP+ OTI CD8 SP thymocytes following cocultured with SIINFEKL-pulsed peritoneal macrophages (Fig. 3C). Innate CD8 T cells expressing the transgenic OTI TCR secreted about three times more IFN-γ than did conventional OTI T cells, as estimated by ELISA (Fig. 3C). A further time-course evaluation using intracellular staining for IFN-γ revealed that innate OTI cells responded more rapidly to Ag stimulation than did conventional T cells (Fig. 3D) The key point is that CD8 thymocytes with an innate phenotype display the behavior expected from innate T cells (4, 8). To evaluate how conventional and innate CD8 thymocytes would thrive in the periphery, we injected sorted GFP+CD44lo or GFP+CD44hi CD8 SP thymocytes from RAG2p-GFP mice into TCRβ−/− lymphopenic hosts, which have no TCRαβ+ T cells (Fig. 4A). In recipient thymi, only trace amounts of CD8+CD4− cells were found, which corresponded to immature SP thymocytes (TCRβ−; data not shown) (Fig. 4B). T cells that expand in lymphopenic hosts upregulate CD44 expression (31). Therefore, 4 wk after injection of GFP+CD44lo or GFP+CD44hi CD8 SP thymocytes in TCRβ−/− hosts, all CD8 T cells recovered from the spleen were CD44hi. The notable finding is that the number of CD8 T cells recovered was 2-fold greater in recipients of conventional, as opposed to innate, CD8 thymocytes (Fig. 4B, 4C). Therefore, innate CD8 T cells can expand in a lymphopenic host but to a lesser extent than conventional CD8 T cells. Innate CD8 T cells expand less than do classic CD8 T cells under lymphopenic condition. A, Schematic representation of the experimental design used for evaluation of conventional versus innate CD8 thymocyte proliferation in TCRβ−/− mice. B, Proportion of CD8 T cells in TCRβ−/− mice, 4 wk after injection of innate or conventional CD8 thymocytes. Similar results were obtained in three independent experiments. C, Absolute numbers of CD8 T cells in TCRβ−/− mice, 4 wk after injection of innate or conventional CD8 thymocytes (n = 3–4 mice/group). *p < 0.05. Expression of cell surface B7-H1 was dramatically increased on innate relative to conventional CD8 SP thymocytes (Fig. 1E). B7-H1 (PD-L1, CD274) is a member of the Ig superfamily of molecules that is widely expressed on a broad range of tissues and cells (32, 33). B7-H1 is known to interact with both programmed death (PD)-1 and CD80 (34), but the existence of an additional receptor involved in T cell activation and apoptosis has also been suggested (35). Upon binding to its receptors on target cells, B7-H1 regulates the activation and differentiation of T cells in both positive and negative fashions (32, 35). Therefore, we sorted conventional and innate GFP+ CD8 SP thymocytes, activated them in vitro with anti-CD3/CD28 Ab-bound beads, and analyzed expression of PD-1 and B7-H1 expression by flow cytometry. After stimulation for 3 d, conventional and innate CD8 thymocytes upregulated PD-1 in a similar fashion (Fig. 5A, middle panels). In contrast, B7-H1 was upregulated to much higher levels on innate CD8 thymocytes than on conventional CD8 thymocytes (Fig. 5A, lower panels). Therefore, both unstimulated (Fig. 1E) and stimulated (Fig. 5A) innate CD8 thymocytes expressed much greater amounts of B7-H1 than did conventional CD8 thymocytes. These observations led us to investigate the effect of B7-H1 blockade on T cell proliferation and IFN-γ production. Treatment with B7-H1–specific Ab caused expansion of conventional CD8 thymocytes but decreased the accumulation of innate CD8 thymocytes (Fig. 5B). Likewise, treatment with anti–B7-H1 Ab enhanced secretion of IFN-γ by conventional CD8 thymocytes but had the opposite effect on innate CD8 thymocytes (Fig. 5C). To further investigate how B7-H1 ligation impinged on the function of innate CD8 thymocytes, we assessed its impact on the viability of thymocytes after stimulation for 24, 48, or 72 h. Treatment with anti–B7-H1 Ab led to a significant increase in cell death of innate thymocytes relative to conventional thymocytes, which was most conspicuous at 48 h (Fig. 5D). We concluded that innate CD8 thymocytes are unduly susceptible to apoptosis upon B7-H1 ligation. B7-H1 ligation induces apoptosis of innate CD8 T cells. A, Expression of PD-1 and its ligand B7-H1 on sorted conventional or innate CD8 thymocytes following stimulation with anti-CD3/CD28–coated beads (one bead for three cells). B, Proliferation following CD3/CD28 stimulation in the presence of increasing concentrations of B7-H1–specific Ab (red line) or its corresponding isotype (black line). C, To evaluate IFN-γ secretion, culture supernatants were analyzed by flow cytometry using CBAs. The upper left panel shows all cytokines detected by the CBA. With the exception of IFN-γ, no change in the secretion of other cytokines was detected. Top panels and bottom panels are representative of conventional and innate thymocytes, respectively. D, Flow cytometry analysis of apoptosis in stimulated T cells cultured in the presence of B7-H1–specific Ab (6 μg/ml; right rows) or an isotype control (left rows). All experiments in this figure were repeated at least three times, with similar results. *p < 0.05. To further evaluate the effector functions of innate CD8 thymocytes, we used CBAs to analyze cytokine secretion following CD3/CD28 stimulation. Both conventional and innate CD8 thymocytes produced IFN-γ and TNF-α upon stimulation (Fig. 6A), but greater amounts of both proinflammatory cytokines were secreted by innate than by conventional CD8 thymocytes (Fig. 6B). In addition, analyses of cytokine receptor expression revealed that innate CD8 T cells expressed higher levels of IL-2Rβ (CD122) than did conventional CD8 T cells and that IL-4Rα was found only on innate T cells (Fig. 6C). To evaluate responsiveness to IL-2, conventional and innate CD8 thymocytes were stimulated with anti-CD3/CD28 Ab-coated beads in the presence or absence of rIL-2. In the absence of exogenous IL-2, innate and conventional CD8 thymocytes expanded to similar levels (Fig. 6D). However, addition of IL-2 led to a more massive expansion of innate than conventional CD8 thymocytes (Fig. 6D). Hence, consistent with their higher expression of IL-2Rβ, innate CD8 thymocytes were more responsive to IL-2 than were conventional CD8 thymocytes. Cytokine secretion and responses. A, Representative CBA analysis of sorted conventional (CD44lo) or innate (CD44hi) CD8 T cells following CD3/CD28 stimulation. All cytokines detected by the CBA are shown in the upper panel. With the exception of IFN-γ and TNF-α, we detected no changes in secretion of other cytokines. Unstimulated conventional CD8 T cells were used as a negative control. B, CBA analysis of IFN-γ and TNF-α secretion following CD3/CD28 stimulation (n = 6 mice/group). *p < 0.05. C, Representative flow cytometry analysis of cytokine receptors on conventional or innate CD8 T cells. Isotype control is shown only for conventional CD8 T cells, because similar results were obtained with innate CD8 T cells. D, Conventional (left panel) versus innate CD8 T cell (right panel) proliferation following anti-CD3/CD28 stimulation with or without rIL-2 (0.01 pmol/well). As a negative control, sorted lymphocytes were cultured in media without stimulation. Similar results were obtained in three independent experiments (n = 4 mice/group). *p < 0.002. E, Proliferation of eFluor 670-labeled sorted conventional or innate CD8 T cells was analyzed by flow cytometry following addition of 2 μg/ml rIL-4. Similar results were obtained in three independent experiments. F, Representative dose-response curve for proliferation of conventional or innate CD8 T cells with or without rIL-4 (n = 5 mice/group). *p < 0.05. Similar results were obtained in three independent experiments. G, Representative flow cytometry analysis of IL-4Rα and IL-7Rα expression on conventional versus innate CD8 T cells following addition of 2 μg/ml rIL-4. H, Representative proportion of CD44hi CD8 thymocytes in RAG2p-GFP IL4+/− and RAG2p-GFP IL4−/− littermates (gated on GFP+ thymocytes). Similarly, we analyzed the response of both thymocyte subsets to rIL-4 and found a dose-dependent increase in the proliferation of eFluor 670-labeled innate CD8 T cells relative to conventional CD8 T cells (Fig. 6E, 6F). In contrast to most cytokine receptors [e.g., IL-7Rα (36)], IL-4Rα is upregulated after cytokine binding (37). We further confirmed that, in response to rIL-4, innate CD8 T cells upregulated expression of cell surface IL-4Rα (Fig. 6G, top panels) and downmodulated that of IL-7Rα (Fig. 6G, bottom panels). Furthermore, compared with RAG2p-GFP IL4+/− littermates, RAG2p-GFP IL4−/− mice showed less abundant innate CD8 thymocytes (Fig. 6H). In summary, compared with their conventional counterparts, innate CD8 thymocytes overexpress IL-2Rβ and IL-4Rα, are more responsive to IL-2 and IL-4, and secrete more IFN-γ and TNF-α following stimulation. Moreover, the size of the innate CD8 thymocyte pool is partially, although not totally, IL-4 dependent. In RAG2p-GFP mice, recent thymic emigrants progressively become GFP− over time (15). As a result, innate CD8 T cells cannot be distinguished from effector-memory phenotype CD8 T cells in peripheral compartments. Nevertheless, two findings suggest that innate CD8 T cells may represent ∼5% of CD8 T cells in the periphery: ∼10% of CD8 SP thymocytes are innate thymocytes (Fig. 1A, Supplemental Fig. 1), and they expand ∼2-fold less in the periphery than do conventional CD8 thymocytes (Fig. 4). In our quest to understand whether innate CD8 T cells have nonredundant roles, we asked whether the minor population of innate CD8 T cells might provide help to the major population of conventional CD8 T cells when present in “physiological” proportions (conventional/innate ratio of 20:1). To explore the potential helper properties of innate CD8 T cells, we designed a system in which SIINFEKL-pulsed peritoneal macrophages were cultured with OTI-responding cells with or without bystander cells (OTI cell/bystander T cell ratio = 20:1) (Fig. 7A). Bystander cells were purified conventional or innate CD8 thymocytes from RAG2p-GFP mice. Cultures containing innate CD8 T cells produced greater amounts of IL-2 than did other cultures (Fig. 7B). Because OTI T cells exclusively express the Vα2-chain, we performed Ag-stimulation assays using eFluor 670-labeled T cells and analyzed separately the proliferation of Vα2+ and Vα2− T cells. The proportion of Vα2+ elements among wild-type CD8 T cells is ∼6%. Thus, in our experimental conditions, all Vα2− T cells were bystander T cells, whereas Vα2+ cells contained 99.7% OTI T cells and 0.3% bystander T cells (bystander T cell/OTI cell ratio × frequency of Vα2+ elements in bystander T cells = 0.05 × 0.06 = 0.003). Accordingly, Vα2+ cells in this assay are referred to as OTI cells. Interestingly, we found that none of the added third-party cells (conventional or innate CD8 thymocytes) proliferated, whereas OTI T cells proliferated robustly (Fig. 7C), particularly in the presence of innate CD8 T cells (mean fluorescence intensity of 1481 for the innate group versus 3380 for the conventional group). In addition, intracellular labeling for IL-2 revealed that 50% of OTI T cells mixed with innate CD8 thymocytes produced IL-2, as opposed to 30% for OTI T cells cultured in the presence of conventional CD8 thymocytes (Fig. 7D). Likewise, innate CD8 thymocytes enhanced IFN-γ secretion by OTI cells (Fig. 8A, 8B). OTI T cells were the sole source of IL-2 and IFN-γ in these experiments, because Vα2− T cells did not secrete IL-2 or IFN-γ (Figs. 7D, 8B). Therefore, although innate CD8 T cells were not responsive to SIINFEKL, they helped OTI T cells to proliferate and secrete IL-2 and IFN-γ upon stimulation with SIINFEKL. Innate CD8 T cells can provide help to OTI T cells. A, Schematic representation of the experimental design. B, IL-2 concentration in cultures was estimated by ELISA (n = 5 mice/group). *p < 0.002. C, eFluor 670 content in Vα2+ (OTI) and Vα2− (bystander) T cells following stimulation with SIINFEKL-pulsed macrophages. Bottom panel shows control OTI cells cultured (in the absence of Vα2− cells) with macrophages pulsed or not with SIINFEKL. D, Staining for intracellular IL-2. All experiments shown in this figure were repeated at least three times, with similar results. Help by innate CD8 T cells requires CD44. A, Secretion of IFN-γ following stimulation with SIINFEKL-pulsed macrophages was estimated by ELISA (n = 5 mice/group). *p < 0.002. 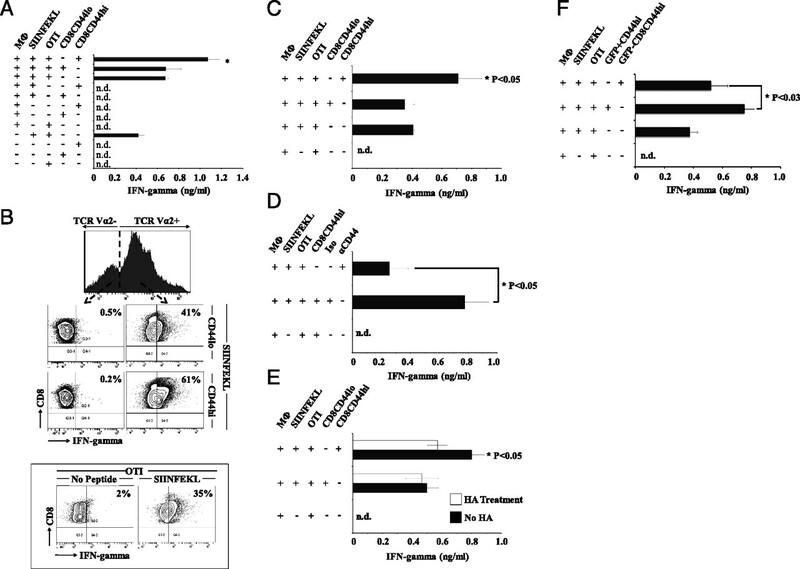 B, Representative intracellular staining for IFN-γ production by Vα2+ (OTI) and CD44hi or CD44lo Vα2− (bystander) T cells. Negative and positive controls were cultured in the absence or presence of SIINFEKL, respectively. C, Culture conditions were as in A, except that macrophages were fixed with paraformaldehyde (n = 5 mice/group). *p < 0.05. D and E, Bystander CD8 T cells were treated with anti-CD44–neutralizing Ab (αCD44) or hyaluronan for 1 h prior to their addition to the cell culture (n = 5 mice/group). *p < 0.05. F, We compared the helper activity of two populations of CD8+CD44hi T cells harvested from the thymus of RAG2p-GFP mice: GFP+ innate thymocytes and GFP− cells, which are recirculating activated-memory CD8 T cells (n = 5 mice/group). *p < 0.03. All experiments shown in this figure were repeated at least three times, with similar results. We next asked whether help provided by innate CD8 thymocytes resulted from interactions with macrophages or OTI T cells. We found that replacing live macrophages with fixed macrophages did not abrogate the helper activity of innate CD8 thymocytes (Fig. 8C). Hence, bystander help did not involve modulation of protein expression or secretion by macrophages. Therefore, we inferred that help resulted from interactions between OTI cells and innate CD8 thymocytes. We next investigated the potential role of CD44, because it is highly abundant on innate T cells, can regulate interactions between immune cells, and can modulate the amplitude of T cell responses (38, 39). We found that treating innate CD8 T cells with a neutralizing Ab against CD44 prior to their addition to cocultures drastically decreased IFN-γ production by OTI cells (Fig. 8D). Hence, CD44 blockade abrogated the helper activity of innate CD8 thymocytes. Hyaluronan is the best-characterized ligand of CD44. Treatment of innate CD8 thymocytes with hyaluronan mitigated their helper activity but had no effect in cultures containing OTI T cells and conventional CD8 thymocytes (Fig. 8E). Of course, high expression of CD44 is not unique to innate T cells because it is a typical feature of effector and memory T cells. This raises the question: Would any CD8+CD44hi T cells display bystander helper function? To evaluate this issue, we compared the bystander effect of two populations of CD8+CD44hi T cells harvested from the thymus of RAG2p-GFP mice: GFP+ innate thymocytes and GFP− cells, which are recirculating activated-memory CD8 T cells (15). We found that the helper activity of innate CD8 thymocytes was superior to that of conventional memory-phenotype CD8 T cells (Fig. 8F). This suggested that upregulation of CD44 is necessary, but not sufficient, to explain the bystander effect of innate CD8 T cells. Some additional factor must contribute to the unmatched ability of innate T cells to provide bystander help to conventional CD8 T cells. Using RAG2p-GFP mice, we conclusively demonstrated the presence of polyclonal innate CD8 TCRαβ+ T cells in the normal thymus. Approximately 10% of CD8 SP thymocytes were innate T cells. They differed in many respects from conventional CD8 thymocytes and were similar to innate CD8 T cells generated extrathymically (9, 10) or in the thymus of mutant mice (4, 8). 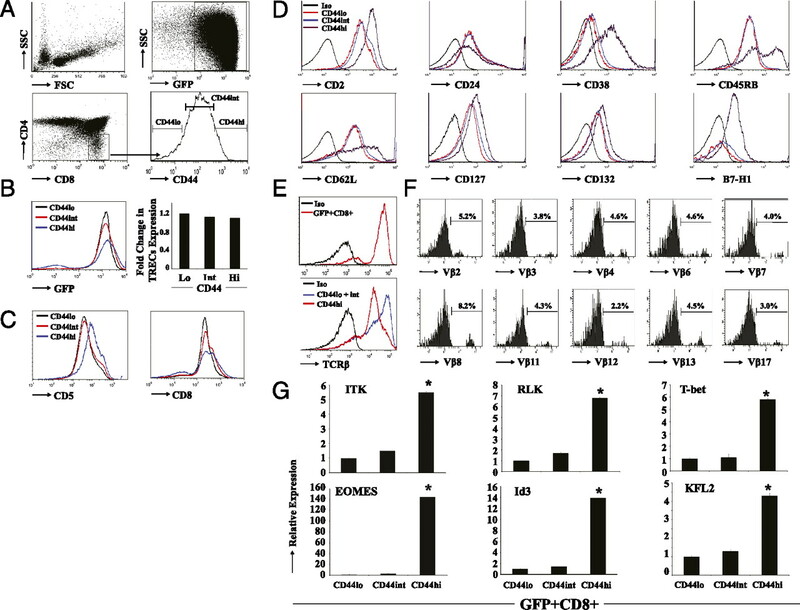 Based on two criteria, the amount of sjTRECs and the concentration of RAG2p-dependent GFP, innate and conventional CD8 thymocytes had undergone the same number of cell divisions after rearrangement of their TCRα-chains. This suggested that decision between the conventional and innate fate occurs during positive selection. Mice deficient for ITK/RLK kinases or transcription factors ID3 and KLF2 display increased frequencies of innate CD8 T cells. Interestingly, we found that innate polyclonal CD8 thymocytes express high levels of Itk, Rlk, Klf2, and Id3 transcripts. This apparent paradox illustrates the dichotomy between the cell-intrinsic and -extrinsic effects of these genes on innate T cells. Indeed, recent studies showed that the dominant impact of Itk, Klf2, and Id3 deficiency on innate CD8 T cells is indirect: deletion of these genes enhances the development of PLZF+ NKT cells, which are the main source of intrathymic IL-4, and IL-4 drives innate CD8 T cell development by upregulating Eomes (8, 11, 12, 40). The present report suggested that further work is warranted to evaluate the cell-autonomous role of Itk, Rlk, Klf2, and Id3 upregulation in innate CD8 thymocytes. Several mechanisms have been proposed to explain the emergence of innate CD8 T cells. First, by analogy with CD4+/−CD8− NKT cells, which are selected by CD1d+ thymocytes, we and other investigators proposed that innate CD8 T cells are selected by interactions with hematopoietic cells rather than TECs (4, 9). Indeed, MHCI+ hematopoietic cells are sufficient for selection of innate CD8 T cells in several mutant mouse models (28, 41, 42). However, the latter studies on transgenic or knockout mice did not demonstrate that MHCI+ hematopoietic cells were necessary (or more effective than were MHCI+ nonhematopoietic cells) for selection of innate CD8 T cells. Anyhow, the current study showed that polyclonal innate CD8 thymocytes in a normal thymus are selected mainly by nonhematopoietic cells. Again by analogy with CD4+/−CD8− NKT cells, the sufficiency (although not the necessity) of MHCIb for selection of some innate CD8 T cells led to the speculation that selection by MHCIb might be instrumental in dictating the innate fate of CD8 thymocytes (4, 41). However, in our analyses of hematopoietic chimeras, the deficit in innate CD8 thymocytes was of similar magnitude in KbDb−/− and β2m−/− hosts (Fig. 2B). Because KbDb−/− hosts express normal levels of MHCIb, our observations suggested that innate CD8 thymocytes are selected mainly by MHCIa+ TECs. Differences in TCR signal strength have a pervasive influence on decision checkpoints in thymocytes development: divergence of αβ versus γδ and CD4 versus CD8 lineages, as well as positive versus negative selection (43–46). Likewise, it was proposed that TCR signal strength during positive selection might determine whether CD8 thymocytes will adopt a conventional versus innate fate. This hypothesis has been supported by two observations. First, innate polyclonal extrathymic CD8 T cells that develop in oncostatin M-transgenic mice express higher amounts of CD5 than do conventional thymocytes, and CD5 expression is proportional to TCR signaling strength received during positive selection (24, 25). Second, deletion of Itk, which functions downstream of the TCR to phosphorylate and activate the signaling molecule phospholipase C-γ1 (47), leads to expansion of innate CD8 thymocytes (4). However, it is less clear how deletion of Klf2, which causes expansion of innate CD8 T cells, could affect the strength of TCR signals during positive selection, inasmuch as Klf2 is not expressed in double-positive thymocytes (8). Furthermore, the hypothesis that innate CD8 T cells are selected by strong TCR signals is difficult to reconcile with reports that IL-4 produced by NKT cells can confer this innate phenotype on the majority of CD8 T cells (11, 13). Therefore, a plausible hypothesis is that the key element is not the strength of the TCR signal per se but rather the perceived TCR signal strength (13). We found that, relative to conventional CD8 thymocytes, innate CD8 thymocytes expressed greater amounts of B7-H1 and CD5 (Fig. 1C–E), two molecules that are upregulated by strong TCR signals (48, 49). CD5 and B7-H1 are negative regulators of TCR signaling, and their upregulation is important for maintenance of tolerance and prevention of autoreactivity (33, 50, 51). Upregulation of CD38, which was found on innate CD8 thymocytes (Fig. 1E), is also found on Ag-stimulated T cells where it is recruited at the immunological synapse, but its role remains unclear (52, 53). TCR downmodulation on innate CD8 thymocytes (Fig. 1) would also be consistent with strong TCR signals. Indeed, TCR downregulation is a byproduct of strong TCR ligation that is instrumental in maintenance of self-tolerance to high-affinity self-epitopes (54, 55). To the best of our knowledge, TCR downmodulation had not been previously evaluated in thymus-derived innate T cells but is typically found in extrathymic innate CD8 T cells (28, 56). Together, our data suggested that generation of innate thymocytes in a normal thymus is contingent upon perception of strong TCR signals. But how would perception of strong TCR signals force CD8 thymocytes to adopt an innate fate? Following TCR-mediated positive selection, double-positive thymocytes become responsive to intrathymic γc cytokines, such as IL-7 and IL-4 (57). IL-4 produced by PLZF+ thymocytes is important for development of innate CD8 T cells in several mutant mouse models (reviewed in Ref. 8). Finally, we found that innate CD8 thymocytes express higher amounts of IL-4Rα, are more responsive to IL-4 than are conventional CD8 thymocytes, and are less abundant in IL-4–deficient mice (Fig. 6). The fact that IL-4 expression is upregulated by IL-4 (37) suggests that our innate CD8 thymocytes have bound and responded to intrathymic IL-4. Therefore, we proposed that perception of strong TCR signals during positive selection enhances responsiveness to IL-4 and leads to adoption of an innate-differentiation program by CD8 thymocytes. Alternatively, CD8 thymocytes may perceive a stronger TCR signal in the presence of IL-4 signaling. Although IL-4Rα deficiency totally abrogated the expansion of innate CD8 T cells in mice deficient for ITK, KLF2 or ID3 (8), the effect of IL-4 deficiency in our model was less drastic. Of note, IL-4Rα deficiency hampers not only IL-4 but also IL-13 signaling (58). Therefore, we propose that IL-13 might partially compensate for the lack of IL-4 and support the generation of reduced numbers of innate CD8 T cells in IL-4−/− mice. If innate CD8 thymocytes do receive stronger TCR signals, what might be the source of the strong TCR signals? The strength of TCR signal depends mainly on the cell surface density and affinity of MHC–peptide complexes that interact with the TCR (46). Cortical TECs express a unique type of proteasome called the thymoproteasome, characterized by the presence of the β5t catalytic subunit encoded by the Psmb11 gene (59). Cortical TECs contain ∼85% thymoproteasomes (cataLUs β1iβ2iβ5t) and 15% immunoproteasomes (β1iβ2iβ5i) (27, 59). Other thymic cell populations that may contribute to positive selection, thymocytes and dendritic cells, express mainly immunoproteasomes and a minor proportion of constitutive proteasomes (β1β2β5) (60–62). Thymoproteasomes generate MHC I-associated peptides that differ, at least in part, from those generated by other proteasomes. Therefore, cortical TECs can present both thymoproteasome-dependent and -independent peptides. whereas other cells can present only thymoproteasome-independent peptides. Expression of thymoproteasomes by cortical TECs is essential for positive selection of most, although not all, CD8 thymocytes (27). Because of their low chymotrypsin-like activity, thymoproteasomes are predicted to generate peptides that bind MHC I molecules with low affinity and, therefore, yield unstable MHC–peptide complexes (59, 63). It would seem plausible that being more stable, thymoproteasome-independent MHCI–peptide complexes would elicit stronger TCR signals. Therefore, we speculated that thymocytes selected by thymoproteasome-independent peptides would be biased toward an innate fate. In accordance with this hypothesis, thymoproteasome-deficient mice harbor an increased proportion of memory-phenotype CD8 T cells (27), which might be innate T cells. Some TCRs, such as OTI, can be selected by thymoproteasome-independent peptides (27), and we observed that OTI T cells can adopt an innate or conventional fate (Fig. 3). Therefore, one testable hypothesis is that conventional and innate CD8 thymocytes result preferentially from selection by thymoproteasome-dependent and -independent peptides, respectively. The fact that they can present only thymoproteasome-independent peptides might explain why hematopoietic cells are sufficient (although not necessary) for selection of innate, but not conventional, CD8 T cells in several mutant mouse models (28, 41, 42). Nevertheless, although they are sufficient for selection of some CD8 SP thymocytes via presentation of thymoproteasome-independent peptides, hematopoietic cells do not have any clearly defined nonredundant role in selection of CD8 thymocytes. Thus, even in the case of innate CD8 thymocytes, positive selection is driven mainly by TECs (Fig. 2A, 2B). Differences between TECs and other cell types are not limited to expression of thymoproteasome-dependent peptides, and the role of the various TEC attributes in positive selection has yet to be worked out (64, 65). In animals equipped with innate cells (e.g., NK cells) and conventional CD8 T cells, do innate CD8 T cells have a nonredundant role? Studies in oncostatin M-transgenic mice infected with lymphocytic choriomeningitis virus have allowed us to evaluate the protective value of innate T cells in the absence of conventional T cells (66). In this model, innate CD8 T cells could not substitute for conventional T cells in providing long-term control of infection, because they underwent proliferative exhaustion and apoptosis (10, 67). Nevertheless, innate CD8 T cells initiated proliferation swiftly, secreted copious amounts of IFN-γ, and were able to provide initial control of lymphocytic choriomeningitis virus infection. Accordingly, it has been proposed that innate CD8 T cells may be important during the early phase of infection, mainly because of their ability to secrete large amounts of IFN-γ (4, 8). However, prompt secretion of IFN-γ is an attribute shared by other types of memory-phenotype CD8 T cells, as well as NK cells (8, 68, 69). 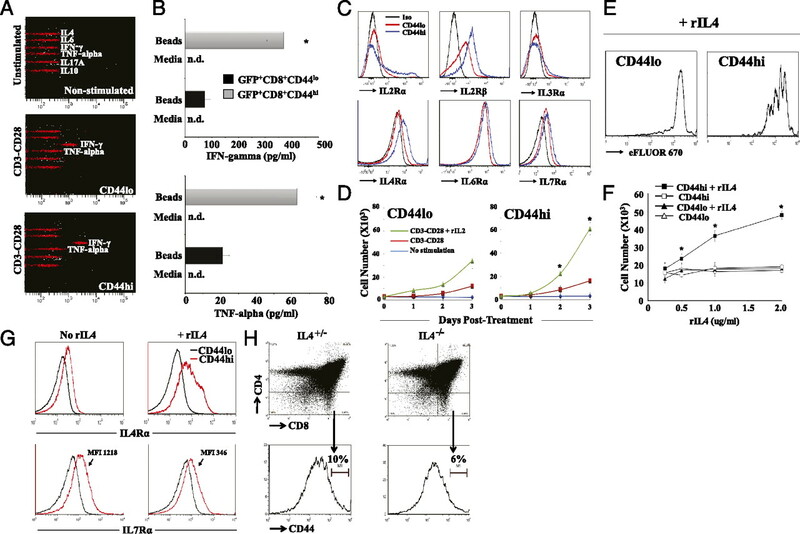 Therefore, it is noteworthy that the present work highlighted a previously undescribed CD44-dependent helper effect of innate CD8 T cells on conventional CD8 T cell expansion and cytokine secretion (Figs. 7, 8). Because the helper activity of innate CD8 T cells seemed to be superior to that of other memory-phenotype CD8 T cells, further studies are warranted to evaluate its biological relevance. We thank Danièle Gagné for flow cytometry and cell sorting, Raphaëlle Lambert for qPCR experiments, and the staff of the Institute for Research in Immunology and Cancer animal care facility for assistance. This work was supported by Grant MOP 42384 from the Canadian Institute of Health Research. M.R. holds a Canadian Institute of Health Research fellowship, and C.P. holds a Canada Research Chair in Immunobiology. The Institute for Research in Immunology and Cancer is supported in part by the Canadian Center of Excellence in Commercialization and Research, the Canada Foundation for Innovation, and the Fonds de la Recherche en Santé du Québec. 2002. Uncertainties - discrepancies in immunology. Immunol. Rev. 185: 103–125.
. 2008. Evolution of the immune system. In Fundamental Immunology, 6th Ed. Paul W. E., ed. Lippincott Williams & Wilkins, Philadelphia, p. 56–124. 2009. Principles of adaptive immunity. In The Immune System, 3rd Ed. Parham P., ed. Garland Science, New York, p. 71–92. 2007. Signalling through TEC kinases regulates conventional versus innate CD8(+) T-cell development. Nat. Rev. Immunol. 7: 479–485.
. 2011. Alternative memory in the CD8 T cell lineage. Trends Immunol. 32: 50–56.
. 2006. T-cell development: an extrathymic perspective. Immunol. Rev. 209: 103–114.
. 2008. Why T cells of thymic versus extrathymic origin are functionally different. J. Immunol. 180: 2299–2312.
. 2010. T cells expressing the transcription factor PLZF regulate the development of memory-like CD8+ T cells. Nat. Immunol. 11: 709–716.
. 2009. Histone acetyltransferase CBP is vital to demarcate conventional and innate CD8+ T-cell development. Mol. Cell. Biol. 29: 3894–3904.
. 2010. SAP protein-dependent natural killer T-like cells regulate the development of CD8(+) T cells with innate lymphocyte characteristics. Immunity 33: 203–215.
. 2010. PLZF induces the spontaneous acquisition of memory/effector functions in T cells independently of NKT cell-related signals. J. Immunol. 184: 6746–6755.
. 2005. T cells targeted against a single minor histocompatibility antigen can cure solid tumors. Nat. Med. 11: 1222–1229.
. 2011. SMAD3 prevents graft-versus-host disease by restraining Th1 differentiation and granulocyte-mediated tissue damage. Blood 117: 1734–1744.
. 2008. The signaling protein Wnt4 enhances thymopoiesis and expands multipotent hematopoietic progenitors through β-catenin-independent signaling. Immunity 29: 57–67.
. 2003. Evidence for adequate thymic function but impaired naive T-cell survival following allogeneic hematopoietic stem cell transplantation in the absence of chronic graft-versus-host disease. Blood 102: 4600–4607.
. 2008. Mouse thymus targeted peptide isolated by in vivo phage display can inhibit bioactivity of thymus output in vivo. J. Biomol. Screen. 13: 968–974.
. 2009. Back to the thymus: peripheral T cells come home. Immunol. Cell Biol. 87: 58–64.
. 2007. Estimating thymic function through quantification of T-cell receptor excision circles. Methods Mol. Biol. 380: 197–213.
. 2010. Regulation of thymocyte positive selection and motility by GIT2. Nat. Immunol. 11: 503–511.
. 2006. Functional CD8+ but not CD4+ T cell responses develop independent of thymic epithelial MHC. Proc. Natl. Acad. Sci. USA 103: 14435–14440.
. 2010. Thymoproteasome shapes immunocompetent repertoire of CD8+ T cells. Immunity 32: 29–40.
. 2002. Thymic and extrathymic T cell development pathways follow different rules. J. Immunol. 169: 684–692.
. 1999. Mice lacking all conventional MHC class II genes. Proc. Natl. Acad. Sci. USA 96: 10338–10343.
. 2000. Cutting edge: naive T cells masquerading as memory cells. J. Immunol. 165: 1733–1737. 2004. Co-inhibitory molecules of the B7-CD28 family in the control of T-cell immunity. Nat. Rev. Immunol. 4: 336–347.
. 2004. Suppression of IL7Ralpha transcription by IL-7 and other prosurvival cytokines: a novel mechanism for maximizing IL-7-dependent T cell survival. Immunity 21: 289–302.
. 1988. Up-regulation of interleukin 4/B-cell stimulatory factor 1 receptor expression. Proc. Natl. Acad. Sci. USA 85: 8221–8225.
. 2010. CD44 regulates survival and memory development in Th1 cells. Immunity 32: 104–115.
. 2002. Positive selection of MHC class Ib-restricted CD8(+) T cells on hematopoietic cells. Nat. Immunol. 3: 772–779.
. 2009. The Tec kinases Itk and Rlk regulate conventional versus innate T-cell development. Immunol. Rev. 228: 115–131. 2009. Strength of T cell receptor signaling strikes again. Immunity 31: 529–531.
. 2010. Decision checkpoints in the thymus. Nat. Immunol. 11: 666–673.
. 2011. Molecular and genetic parameters defining T-cell clonal selection. Immunol. Cell Biol. 89: 16–26.
. 2005. Tec family kinases in T lymphocyte development and function. Annu. Rev. Immunol. 23: 549–600.
. 2010. Regulation of Zap70 expression during thymocyte development enables temporal separation of CD4 and CD8 repertoire selection at different signaling thresholds. Sci. Signal. 3: ra23.
. 1995. A role for CD5 in TCR-mediated signal transduction and thymocyte selection. Science 269: 535–537. 2009. CD5: a safeguard against autoimmunity and a shield for cancer cells. Autoimmun. Rev. 8: 349–353.
. 1997. The CD38 lymphocyte differentiation marker: new insight into its ectoenzymatic activity and its role as a signal transducer. Immunity 7: 315–324.
. 2008. Antigen-induced clustering of surface CD38 and recruitment of intracellular CD38 to the immunologic synapse. Blood 111: 3653–3664.
. 1994. Levels of peripheral T cell tolerance induced by different doses of tolerogen. Science 263: 674–676.
. 1997. Requirements for peptide-induced T cell receptor downregulation on naive CD8+ T cells. J. Exp. Med. 185: 641–651.
. 1995. Evidence for extrathymic generation of intermediate T cell receptor cells in the liver revealed in thymectomized, irradiated mice subjected to bone marrow transplantation. J. Exp. Med. 182: 759–767.
. 2008. Untangling the complex web of IL-4- and IL-13-mediated signaling pathways. Sci. Signal. 1: pe55.
. 1999. Dendritic cells up-regulate immunoproteasomes and the proteasome regulator PA28 during maturation. Eur. J. Immunol. 29: 4037–4042.
. 2010. Quantifying cross-tissue diversity in proteasome complexes by mass spectrometry. Mol. Biosyst. 6: 1450–1453.
. 2010. Deletion of immunoproteasome subunits imprints on the transcriptome and has a broad impact on peptides presented by major histocompatibility complex I molecules. Mol. Cell. Proteomics 9: 2034–2047.
. 2010. Activity-based profiling reveals reactivity of the murine thymoproteasome-specific subunit beta5t. Chem. Biol. 17: 795–801.
. 2001. Lymphostromal interactions in thymic development and function. Nat. Rev. Immunol. 1: 31–40.
. 2007. Zoned out: functional mapping of stromal signaling microenvironments in the thymus. Annu. Rev. Immunol. 25: 649–679.
. 2008. Development and functional properties of thymic and extrathymic T lymphocytes. Crit. Rev. Immunol. 28: 441–466.
. 2004. Do thymically and strictly extrathymically developing T cells generate similar immune responses? Blood 103: 3102–3110.
. 2003. Memory CD8+ T cells provide innate immune protection against Listeria monocytogenes in the absence of cognate antigen. J. Exp. Med. 198: 1583–1593.